We had another snow day, but this time drawing session was cancelled. Our instructions were to draw the dog or cat at home, but I’m going to share one of my stitchy ladies. She may be my favorite so far. I’ve got two more in progress though, using drawings from this session, and concentrating the embroidery on the negative spaces. Eight and a half years ago, I made a baby quilt for my niece using good night phrases in many languages sent to me by friends in real life and from my blog life. That niece obviously isn’t a baby anymore, and her room has grown and changed with her. Recently, she updated her room to a fun blue scheme, but found a way to continue to incorporate her special quilt. We think the world languages on the quilt coordinate quite well with her world map. I also note a lovely use of purple as a subtle accent throughout the room (and her personal style). I like it! And I’m looking forward to being able to see Violet’s new room in person soon. As I dug up the photo of this quilt I noticed two things: the quilt (and the rejected first try in the linked blog post) is kinda “Modern” from before “Modern” was such a big thing; and Wow, this is my tenth year blogging! I finished my first pair of socks! And it took less than two months. All the construction details are on my Ravelry page. I basically asked my knight night friends what their favorite sock construction methods were and then used them. It probably would have been easier to just choose a pattern and follow it, but there are so many options that I really had no idea where to start in looking for a suitable pattern. What I found out is that I like the Turkish cast-on, toe-up method because it gives a nice smooth toe and there’s no picking up stitches or grafting stitches together later. I tried a short row heel which was quick and easy, but not great for my high instep. So, when knitting for me, a gusset is the way to go. 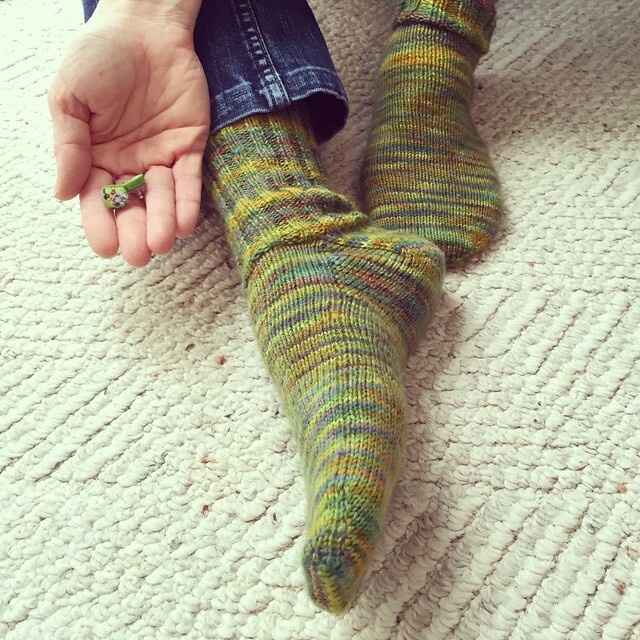 So, now I know some things I like and will look for in my next sock project. The kids have already put in requests! Also, the socks look great with my fiber in resin earrings, so I can build an outfit based on the accessories. Ha! I’m sure most people are familiar with the juggling of schedules and expectations when there’s a snow day at school. I’m in the enviable position that my kids are now old enough to be able to be left home alone if they don’t have school but I still have commitments. Also, my not having a job outside the house makes me quite flexible. Most working parents, especially those of young kids just don’t have that luxury. This is the long way of me saying that because of Thursday’s Snow Day, and the unavailability of an alternate model, our scheduled model had to bring her four-year-old to our drawing session. No problem. We’re not picky about what we get to draw. We had a G rated session and our young guest was eager to get on stage himself. Gotta draw quick though — even the most motivated Kindergartners can’t stand still for long. Next, he let mom model, and our engenue joined the other artists in drawing. We had a few mother son poses, and even pulled it all together for one where he was both modeling and drawing. And finally, if our guest and his mom were modeling, then it stood to reason that others in the room should model too. These are his drawings of me on stage for the last pose. I was sitting on the floor with one leg extended, the other crossed over, and my chin on my hand with my elbow on my knee. I think he totally captured all that! Though not our normal routine, it was a fun and challenging (in a good way) morning of figure drawing. I won’t go so far as to say “bring on the snow days,” but I’m totally OK with “bring your kid to drawing group” days. I had some technical difficulties knitting this Bubbles and Baubles shawl by Tori Gurbisz. No fault of the pattern designer — I was just twisting my stitches but didn’t realize it because I’m not quite there yet in my “reading” of my knitting. I’m better now and I may even knit this pattern again a la the Reversible Circles of Lace scarf. In the mean-time, I still like the shawl and wear it often — particularly with my favorite “I’m an Artist” tunic. As with my other cotton shawls, I seem to do better wearing them like scarves. Also, like so many of my knits, this is Wolle’s Color Changing Cotton yarn. Not scratchy. Love it! This week’s session was good. We had one of my favorite models — the one who dresses up and inspires me to infuse stories into my drawings. No dressing up today, but lots of twisty, fun, challenging poses to draw. I’m not sure where these stitched drawings are leading, but it was an idea I needed to pursue. I’m trying to finish this last one (the original drawing is one of the Jilted Lovers with a knife) in time to submit to Fantastic Fibers at the Yeiser Art Center in Kentucky. After that I’ll need to focus my attention on updating my web site. if things are wonky here next week, just know it’s me futzing around and things should get back to normal soon — hopefully with additional galleries of my more recent work! The purple and the green! What a nice bonus that the purple stripes on my T-shirt look great with my favorite cowl. 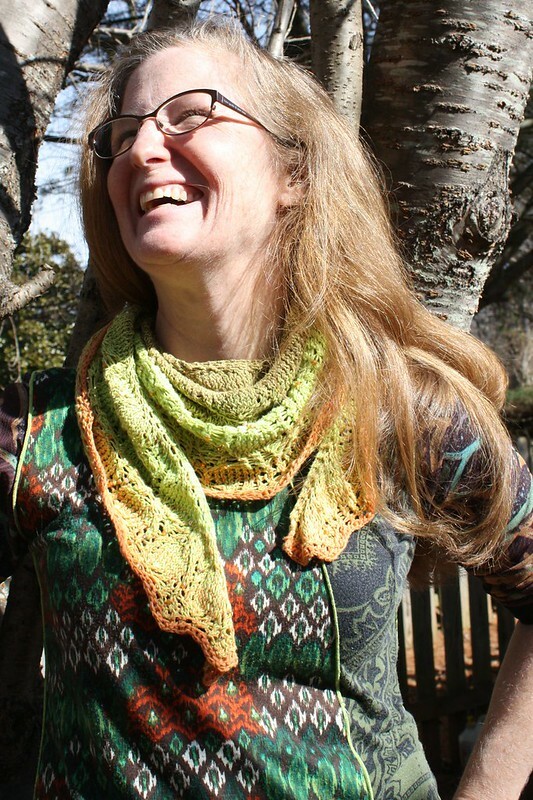 I love the simple, but not too simple, cabled pattern of this Metallurgy Cowl by Nin Leavitt. I also love love love the hand dyed silk and alpaca yarn that I knit it with. It’s from my sort-of local yarn dyer Taylored Fibers and it’s divine.